The Roubo bookstand is to all intents and purposes complete. There is a little more cleanup to do, and maybe some shellac to apply, but I think we can call it as finished as any project on a course can be. 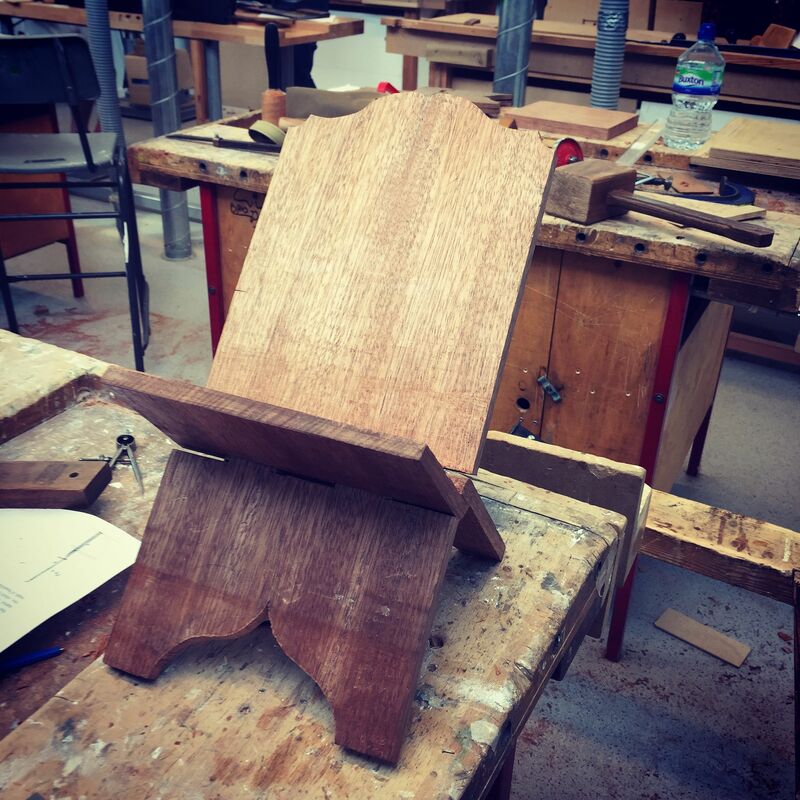 The bookstand is a really fun, if challenging project, and the more I think about it the more I think it is a really useful route to learning a range of new skills. There is cutting some funky shaped mortises (the curved front edge definitely makes things more interesting), accurate layout so that the hinge actually rotates, re-sawing to split the leaves of the stand, and laying out the decorate curves using dividers and clever geometry (very much in the vein of George Walker and Jim Toplin). That’s a pretty sweet set of skills from only one modestly sized piece of timber! 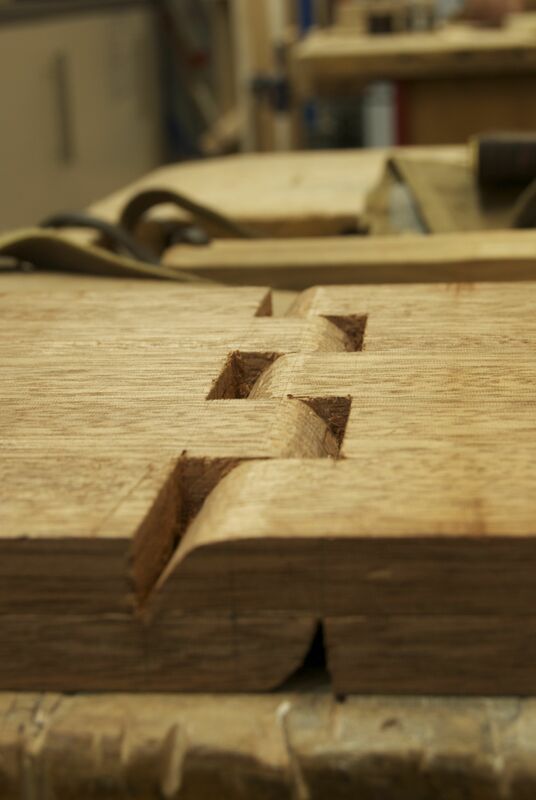 The mortised and carved hinge, ready to be separated. Today started off with chopping the remaining mortises, and fairing up the curved shape of the hinges. 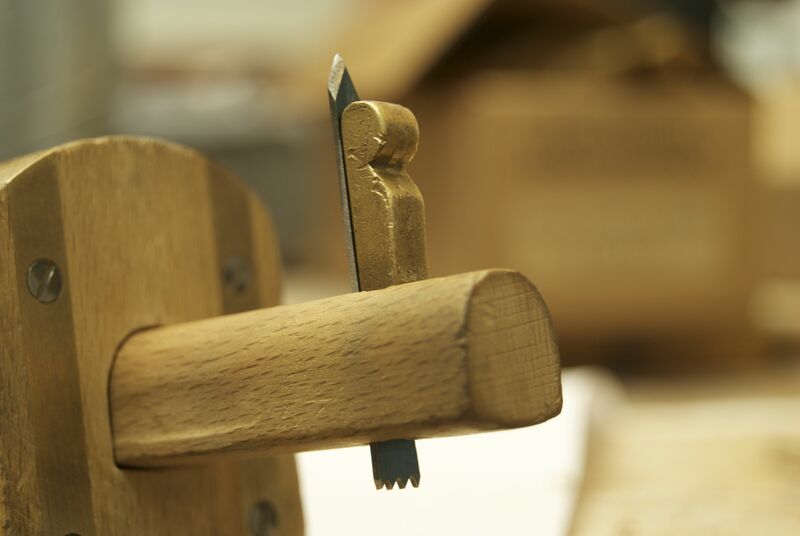 We then separated the hinges, first by establishing a kerf at each side using a toothed cutter in a marking gauge, and then a fine coping saw blade (fed through a 1/16” hole drilled in the corner of each hinge). 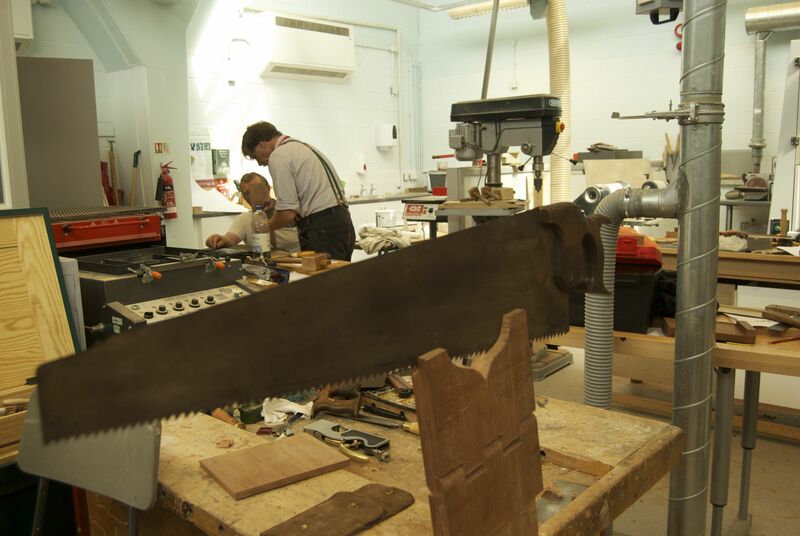 With the hinges separated, it was a case of splitting the leaves using a large (and very aggressive) rip saw. Which obviously wasn’t terrifying at all. Teasing the leaves apart is a matter of some delicacy, and I will wait until I write my full Roubo Bookstand post to describe how we went about this. But once the leaves were separated we cleaned up the show surfaces (leaving the inside surface of the legs in the rough as a mark of authenticity). The decorative curves for the legs and top were scratched out using dividers and simple radii to create flowing curves, and then cut with a coping saw. I may do a spot of clean up with a rasp when I am back in my own workshop, but these looked pretty good straight off the saw. Re-sawing the legs to split the leaves. See, not a terrifying way to imperil nearly two days work at all. 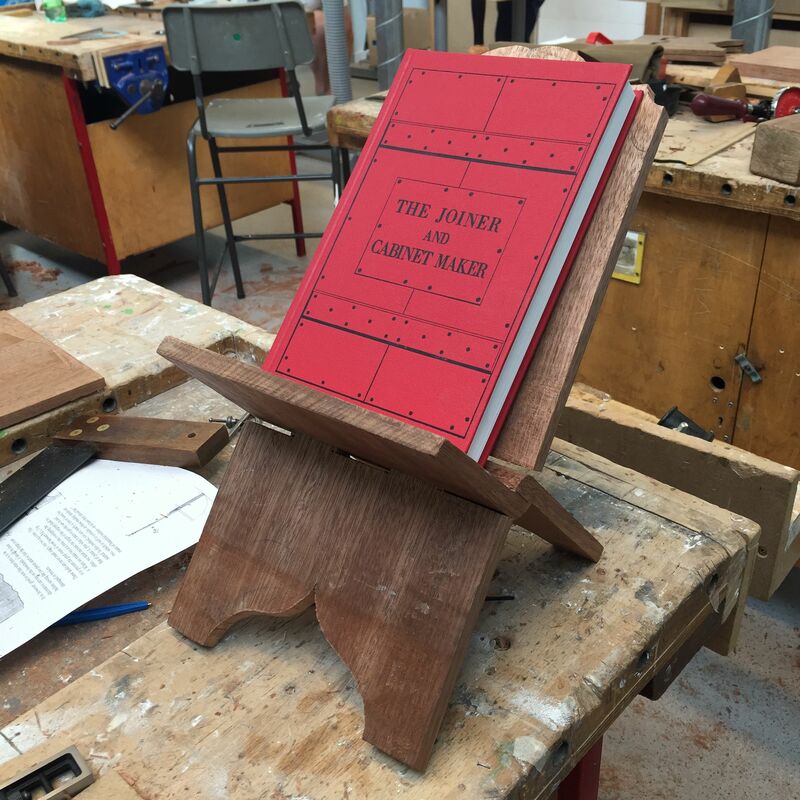 Finally it was a case of testing the bookstand, for which I used my copy of Joiner & Cabinetmaker (which Chris and Katy very kindly signed for me – including the iconic sock monkey emblem!). I’ve really enjoyed building the bookstand, and am looking forward to building some more of these in the near future (just as soon as I have tracked down a big enough bow saw). Testing the bookstand with one of my favourite Lost Art Books. Tomorrow we are starting with a morning of surprise metal work, before moving on to pinch sticks and Roy’s catch box project. So more wonders, curiosities, and skills await. I’m looking forward to it already. *This post is named after a quote by Roy Underhill referring to the tool collection of my good friend and fellow Anarchist Tool Chest survivor Susan Johnson. This entry was posted in Furniture Making, parallel skills, Woodworking with Thomas Jefferson and tagged parallel skills, Roy Underhill by overthewireless. Bookmark the permalink. My wife put in her order for one of those bookstands as soon as she saw Roy make one on the Woodwright’s Shop. Very cool to see your work here. James, this is a super fun project and one which I think you would really dig. The best thing is, if you build the bookstand as Roubo says you should, you make them in pairs. So that’s a first attempt and one to give as a present!